The Catalan club confirmed the extent of Luis Suarez's injury following Sunday's win over Real Betis, with the Uruguay international expected to miss 10-15 days. Luis Suarez is set to be fit for Barcelona's Champions League quarter-final against Manchester United despite suffering a sprained ankle. The 32-year-old was forced to leave the pitch late on as Ernesto Valverde's side stormed to a 4-1 victory over Real Betis in La Liga. Suarez managed to get himself on the scoresheet but Lionel Messi grabbed all the headlines in typically brilliant fashion with a stunning hat-trick. Uruguay international Suarez is Barca's second top goalscorer behind Messi this season, with 18 to his name in the Spanish top flight. He has been forced to withdraw from his country's latest round of international fixtures as a result of his injury plight and he will remain in Barcelona to begin his recovery with the club's medical staff. Uruguay are set to take on Uzbekistan in the China Cup this Friday, but they will now have to make do without their star striker. Barcelona will be hopeful that he can recover in time to play a part in the club's next domestic fixture against Espanyol on March 30, with a view to starting three days later against Villarreal. The Blaugrana also have one eye on a huge Champions League quarter-final clash against Manchester United, with the first leg scheduled for April 10. The last eight tie will begin at Old Trafford before the second leg at the Camp Nou on April 16. 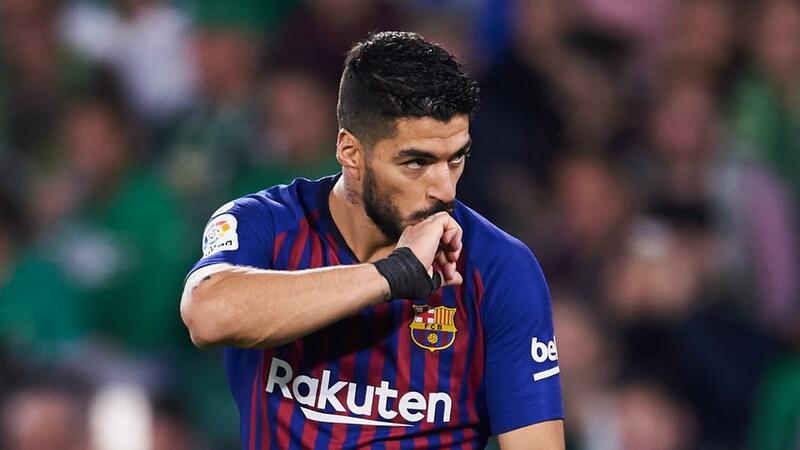 Suarez has enjoyed another stellar season in Catalonia and after finding the net against Real Betis he equalled Diego Forlan's record for goals scored in La Liga by a Uruguayan on 128. The former Liverpool and Ajax hitman has netted 21 goals in 38 appearances for Barca across all competitions, playing a huge role in the club's pursuit of another historic treble. Valverde's men are currently 10 points clear of Atletico Madrid at the top of La Liga, with a Copa del Rey final to look forward to against Valencia in May.